The three factors that are predominant in the areas I fish regularly are: 1. Protection from predators, 2. The availability of prey species, 3. The impact of human activities. 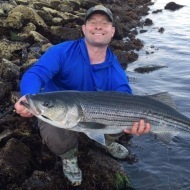 These three factors propel large striped bass to forage at night in near-shore water that can often be no deeper than calf-deep. This brings big striped bass into fly casting ranges of 60 feet or less most of the time. There are exceptions to every rule, so, in some areas I fish even at night where long casts of 80 to 100 feet are required, but that is because of where fish holding structure is located and how close I can get to that structure wading. Also, the minimum casting distance can be much shorter than during daytime if you have good presentation skills and put a heavy focus on maintaining stealth at night. At many areas I don’t wade at all, and I will catch most fish using roll casts of 15 feet or less. 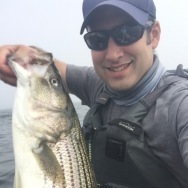 First, let’s examine predators of a striped bass in the inshore environment. There are no really predators of large mature striped bass except seals, osprey, and humans. Seals are just as effective hunting at night as they are in the day, but due to their size, seals require deeper water than striped bass. Osprey are a daylight visual hunter and most effective in shallow water, but at night they stay at nesting sites. So, bass are inclined to go very shallow when there are no night-time predators. I will cover the impact of humans separately, as they have more than just a predator impact on bass behavior. But, by and large, human fishing activity is limited at night. 1. European Green Crabs: Large female crabs primarily are active at night only and will follow a flooding tide, forcing bass to seek them in the shallows. 2. American Eels: Buried in the mud during the day, eels begin actively foraging at night and feed on crustaceans and small fish. Big bass have a hard time passing up an eel from July through September, even if they are already full. 3. American Lobsters: They forage at night primarily and live at rocky structure areas that bass also like to frequent. If you have not read about the world record sinkers and rattling technique you should because it accounts for the current striped bass world record. They make the same noise that a lobster makes when its legs make contact with rocks. Since trophy bass like lobster and using it for bait is illegal, the next best thing is to use a RattleSinker to attract big bass and then show them a live eel on a circle hook. 4. River Herring: Birds are the number one killer of herring when they’re migrating in shallow river systems. To avoid this, movement from brackish water to a lake or river (and, vice versa post-spawning) is focused almost exclusively at night. 5. Sand Eels: To avoid predators, sand eels bury themselves in the sand at night and stay dormant. If you can identify areas during the day with high concentrations of sand eels, you need to come back after dark. I have found the larger bass will come into these areas and attempt to root the sand eels out of their sandy hiding spots. 6. Squid: During daylight, squid are often in very deep water, but, at night, they will come into inshore environments to forage on baitfish. Artificially lit areas attract bait and, in turn, attract squid and stripers. Big and small bait mixed with a nice shadow line can make for explosive fishing. 7. Silversides: During daytime, these fish school up and move into deeper water as a defense against predators and also to feed. At night, when they don’t have the visibility to school up, they seek shallow water over sand bars, in salt marshes, and in tidal pools to try and escape predators. 8. Winter Flounder: Studies show that these fish have a pretty set activity period of moving to deeper channel areas during daylight but then migrating at night to shallow areas near clam and mussel beds. Big bass love to eat adult flounder and their young of the year. Last, human activity greatly affects both striped bass and the fly fisherman. Boat traffic at major harbor areas and tidal creeks with a lot of private moorings and docks negatively affect striped bass feeding. 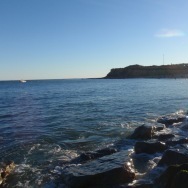 Beach users are swimming and surfing right at the prime inter-tidal zone from the first bar to the lip of the beach. Both of these issues makes fishing difficult. Moreover, at some areas, fishing is restricted to night only. Some of my favorite locations to fish are very crowded during the day, but devoid of people at 2 am to 5 am. Another major factor to consider is artificial light considerations. Artificial light at night will concentrate bait, but it takes about two hours of darkness for a stretch to hold significant bait. Also, the shadow edge gives striped bass an ambush location because it is just like a looking into a lit window of a house at night. You can see the people inside the house great, but they really can’t see you out the window without moving directly to the window and letting their eyes adjust to the darkness. This gives bass a predatory advantage, and they will hunt along the shadow edges of artificially lit areas regularly throughout the season. 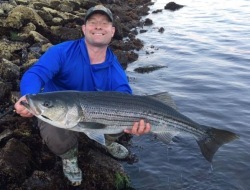 I hope this first article has provided you with a good understanding of why night offers a great opportunity for targeting larger striped bass in near shore locations. The next article will focus on how to gear up for night fly fishing, fly selection considerations, fly casting in the dark, practicing presentations, and picking a location and how to recon it for night fishing. 1. Fly rods: You can use 9-12 weight rods, either single hand or two hand style. • I like a 9-foot, single hand, 9-weight rod for flats and other shallow short game places (casts no longer than 45-50 feet with some 10 feet or less casts needed) like skinny salt ponds or brackish streams less than 3-feet deep. • I use 11-foot, 10 or 12 weight, two-handed rods designed for two-hand overhead casting pretty much everywhere else: beaches, inlets, large estuaries, bridge with room to cast, boulder fields, points, and steep rocky areas. In these areas 20-80 foot casts are required and a two-hand rod really helps me deliver large flies to those longer distances. With the 10 weight, I am throwing 425-500 grain heads, and, on the 12 weight, I am throwing 600-700 grain heads. • If using a single-hand rod for beaches, inlets, large estuaries, or boulder fields, you need one that you can throw 9-12 inch flies or very heavy crab/lobster flies, so an 11 weight is a good starting point. Delivering those flies and having serious backbone, if you hook a 30 lb. fish, is key. • I use a 11’ 7 weight switch rod for salt marshes with lots of dense trees with no back cast room. For bridges or inlets with steep banks, I use a 12’6” 10 weight spey rod. 2. Reels: Other than the Canal, a truly sealed drag system that has 20 lbs. of drag is what you should look for in a reel. At the Canal, you want 30 lbs. of drag and don’t really need a sealed drag, as you can keep from dunking reel. My current reels are an Orvis VO2 and a Redington Behemoth. 3. Lines & Leaders: I like Rio Outbound Short lines in floating for near/on surface presentations with the two-hand 10 weight rod. I like Rio Outbound Short with a S6 head and intermediate running line for fishing near bottom on beaches, inlets, and estuaries with the two-hand 10 weight rod. The Rio Striper Series has a longer head and a softer landing but still handles wind, so I use these lines on my 9 weight rod. On my 12 weight, I am currently using the Rio Levithan Sinking line at 700 grains to get down with big flies in deep fast current. Leaders are simple: 3-4 feet of 20 lb. for 9 weight, 3-4 feet of 25 lb. for 10 weight, 4-5 feet of 40 lb. for my 12 weight. During daylight, I use longer leaders. At night, I use short leaders unless I am nymphing and those are specifically constructed leaders for that purpose. 4. Emergency inflatable pdf and single wading belt worn at all times. In the dark, you will not be aware rouge waves no matter how careful you are. I DO NOT DEEP WADE, as I know great whites have been spotted where I fish, but I fish jetties and other areas where a rogue wave or large boat wake could put me in the water, so I have a life jacket on now at all times. Another solution is a wetsuit, but that would tempt me to wade deep so I don’t have one. 5. Waterproof head lamp and emergency around neck light are a must. Two good options are the Princeton Tec Remix Pro with red LEDs or the Princeton Tec EOS Tactical with red lens cover. For a neck light, I have a small white light pelican on a lanyard which I have yet to use. It is purely a backup in case I lose my head lamp. 6. Inexpensive plastic fish lipper for landing fish in dark will keep you from getting a 6/0 or larger hook through your hand. Schoolies are not dangerous, but a 20 lb. or bigger bass thrashing around can easily put your own hook through your hand. I buy the Yak gear ones they are $10 and make landing big fish easy and safe. If I drop or lose them it’s not a big financial loss like a Boga Grip would be. 7. Heavy duty baker tool for getting large hooks out of large bass mouths. The pliers I use are shorter with a lot of leverage so for any deep hook inside the mouth I reach to these tools. They are also cheap hold up well and if lost not a huge burden financially to replace. 8. Saltwater safe pliers with line cutting jaws. Cutting 20-40 lb. mono requires good cutters. 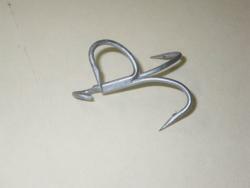 I want strong plies that are stronger than most forceps because I generally am using 3/0-8/0 hooks nothing smaller. 9. Waterproof compass is kept in my surf sling in case fog comes in and I am out on a bar to keep from getting disoriented. This is a must have for safety. 10. Gaia GPS or similar App on Phone is critical to my planning. During daylight, I recon all my spots and take pictures a super low tide. I can store the pictures in the way point in the App. So, when I am fishing at night I can reference the daylight picture of the structure. I also keep any important notes about spot discoveries in the way point’s notes such as what tide provides sufficient water to bring fish into the structure. 11. Waterproof cell phone or cell phone case is key. Your phone is going to get wet so make sure it won’t die when that happens. 12. Clear lens glasses and sunglasses for sunrise (yellow/amber). Clear lenses exclusively at night and I use a yellow lens polarized pair for first light through 7 am (low light but substantial glare due to angle). Yellow is not sufficient for bright light and the ocean so if fishing daylight trying to spot fish my preference is for red lens glasses. 13. Korkers for rocky areas are a must. They keep me from falling on wet rocks that often get weeds on them. I prefer the heavy-duty carbide spike soles, but there are many good options for sole configurations that will work. 14. Mudders for muddy areas are a must at night. I had two very scary run-ins where areas that were primarily hard bottom had some soft spots and in the dark I got disoriented and wandered into them. I was able to get out of my waders and swim out. I retrieved my waders after it was low tide again. I would have been 3 feet under water at high tide since, in that area, a moon tide has a 11 foot swing from low to high tide. I am very cautious in muddy areas, but I find even being cautious in the dark you can make an error so I wear these Mudders to ensure I don’t get stuck. 1. Color: I use black flies on dark nights with little moonlight. On bright nights, I use true natural color imitations. You can use natural on dark nights, too, but don’t use all-black when it’s a bright full moon. 2. Silhouette: When fishing at night, I prefer files with a longer silhouette of at least 9 inches because it seems to deter schoolies from biting. If your goal is not hunting big fish, feel free to use much smaller flies as your main fly. If hunting big fish but if in an area where you know there is a specific pattern like sandeels, peanut bunker, or worms, then I recommend a double fly rig with a small bait imitation as a lead dropper ahead of a long profile trail fly. 3. Rattles: On small profile patterns to match forage, adding a rattle will increase its catch rate at night. I prefer plastic and metal jig rattles over pyrex, which breaks very often on me. On my larger patterns, I use two rattles per fly to give lots of additional noise to the fly. 4. Water push: I like to make all my flies have more defined front sections to help push water at night. Adding a “magic head” to existing flies that match forage at night is a good ad hoc solution to make the jump into night fishing. In general, my large night flies either have a ½ inch to 1-inch diameter head to create front bulk and push water. 5. Special action: Articulation, special tails like “wiggle tails”, or other design features that create a commotion or vibration will help catch more fish. Bulkheads, Game Changers, T Bone, European Pike Style attractor tails are all good ideas for night flies. 6. Scent (heresy I know): At night, it helps. In daylight, it seems to have no impact. I find when bait densities get very high, fish will ignore flies that smell wrong, even if all the other components are a perfect match. I use scent primarily as a last resort to save nights that have been unproductive due to bait concentrations being super dense. 1. When fly fishing with a single-hand rod, I roll cast. I shoot casts out with no false casts at all at night. 2. Using a shooting style line is key to avoiding false casts. I like short heavy heads like the Rio Outbound Series to generate power to avoid false casting. 3. For two-hand overhead casts, there are several decent videos on the internet you can find. I fish the same as a single-hand rod in that I roll cast into a water=loaded back cast, then fire the cast off. I minimize false casting as much as possible. 4. Spey casts are often required at bridges, many inlets, and wooded estuaries. I like a floating double taper line for surface or near-surface presentations. For fishing deep, I use a Skagit system with T-17 sink tips or a 26 foot sinking shooting head. 5. WEAR CLEAR EYE PROTECTION AND A HOOD. This will save your ears and your eyes, trust me. Plus a lightweight sun hoodie at night allows you to spray the hood with bug spray and keep bugs off much better than having no hood. My glasses saved my right eye twice in the last 10 years of fly fishing. 1. Focus on one specific area for both day and night fishing, so you learn how the tide impacts that spot a every stage. Each spot has one or two peak windows that seem to bring the big fish in range of a wading angler. Mastering how the tide impacts each spot in daylight will allow you to effectively present the fly there at night. 2. Practice your presentations in daylight. You need to know if your swing is getting down to the right level. Go fish these spots during the day with your night flies and dial in how that presentation feels by closing your eyes. This will set you up to feel at night if the presentation is working correctly. Fishing by feel takes a lot of practice and there is no penalty if you catch fishing daylight when practicing for night trips. 3. A fly line with no stretch core is essential, as you are fishing by feel all the time. I used to use mono core lines because I liked a clear intermediate tip. At night, this line is not your friend. 4. Glowing running lines. These lines let you see what your casting stroke or your swing is doing in the dark. They don’t spook fish, and I really liked using them. There is a major problem with them, though, and that is they alert other anglers to your location. If you fish the surf at night you will quickly understand how undesirable it is to have other anglers see where you are fishing and if you are catching. When you are fighting a big fish, that bent glowing line pointing into the water is like putting out a neon sign in the darkness “Guy Catching Fish Right HERE”. So, if you are beginner, glowing running lines may help your initial night efforts, but once you start to develop areas that are producing big fish at night, you will discontinue their use to preserve the secrecy of your spots. 1. Start with spots you already fish and that produce schoolies during the day. 2. Pick no more than two spots that you already know produce fish. Then, during the off season when stripers are not around, go during daylight for 1-2 hour scouting trips. You want to keep going at different stages of tide until you have seen what the water movement and other details do at every stage of tide for both neap and spring tides. (IF you don’t know what neap and spring tides are, please look them up this is a very important term for saltwater). This is not a very fun process, so I keep my trips to 2 hours or less. But, if you truly do it as I recommend before the winter is over, you will really know those two spots like the back of your hand. 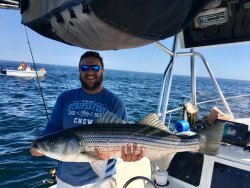 • Identify at what stage in the tide is the minimum amount of water present to allow striped bass to access the area to forage (18 to 24 inches of water is all they need). • Figure out what structure areas identified are accessible to fly casting and at what points in the tide. What you will find is a great piece of structure may hold fish all the time, but with a fly rod and, limited to being on foot, you can only reach it at a very specific tide window. Big fish may always hang on that deep structure, but you can only get at them at a very limited window of time. 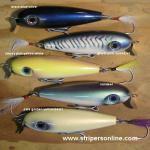 • Probing with bucktails or jigs: To recon a spot I like to fish deep with bucktails or jigs and plastics. I use the jigs contact with bottom to probe and find key pieces of structure. I lose a lot of lures doing this, but it will yield secrets most anglers never uncover. • Hire a boat: I have gotten people to take me out into areas and spend upwards of 2 hours marking spots that I can access from shore using their depth finders to uncover hidden deep structure. • I take a picture of weather forecasts, showing key things such as temperature, pressure trends, and wind direction and trends. • If at a surf location, I take a picture of the surf forecast. • I take a picture of the tide chart for that time window. • I then track all fish caught with time caught, location caught, presentation/fly used, and length of fish caught. If I notice anything pertinent, I add that note as well, such as if a fish spits up what it was feeding on. • Later, I will correlate the times/locations of fish caught with the tide, surf, and weather data. I start to figure out key things such as that all 40 inch fish caught in one area are when high tide is 10 feet or higher and occurs between 11 pm to 2 am. That info later helps you choose when you fish. • Only log after you are done fishing because this will spook any stripers present. Use your bright white light to search grass edges or shallows for presence of eels, worms, baitfish, crabs, lobsters, and other “prey” items. • Also, track the light levels. Was it a bright moonlit night or was it a pitch-black clouding new moon night? • Lastly, note if you heard fish feeding but could not identify what they were feeding on. Later, you may get other information that will help you solve that puzzle for next season so keep notes on frustrating events such as feeding sprees that you fail to hook any fish in at night. I hope you enjoyed this post. The next post will focus on “How to Fish at Night”. This will include the importance of stealth and field craft, finding fish using visual and audio clues in the dark, fly presentation tactics, and example fishing scenarios. This next article will give you actionable strategies you can apply to areas you either currently fish during the day or recon this winter. Thanks Dan. I really enjoy reading your blogs on the other site. Very helpful in my quest to catch a big one from the beach. Thanks Graveyard. You've been the top contributor in my book over past year due to your long and informative and interesting posts on Canal fishing. Some very interesting stuff and you have a nice balanced take on things that I like. You are truly seeking to inform other, not seeking to boast endlessly and repetitively about your tally of large bass, which you could do if you wanted to! One of my favorite posts was the one where you spotted the school of bass in the tidal creek and then "snowshoed" in with those mud boots and the ladder. Everytime I think I am getting great the stripers hand me a big serving of humble pie. A couple of skunks reminds us its fishing not catching. Glad the info is helpful hope you catch a monster this season! It was all going good for me until you mentioned the infamous rattle sinker..Oh boy..
Good stuff Graveyard. The time spent putting that together is appreciated. I hugely appreciate all the work you've done it is a massive service for the community. One day I plan to live near the coast and put all your learnings into practice myself. Well done and very interesting. Haha unfortunately as much as I want to think its BS the testing I have done pretty much validates his entire concept. Last year I made a heavy lobster fly and rattled it along base of an inlet jetty on cape tight line nymphing. It was lethal on big bass. What kind of scents do you use? Not to go OT but nice meeting last night, and I look forward to the participating, and hopefully contributing. It's clear you have put in the time, and it seems you expect more from yourself than the fish. Right on. I like Pro-Cure Super Gel. I try to match the scent to the bait I think bass are keyed in on at night. Once you use the scent on that fly just understand you need to keep it in a zip lock bag as it will stink. That is the main reason I don't use it regularly and only use it when I know there is a lot of bait and bass present, but I am struggling to get fish to hit my fly at night. If the scent easily washed off at the end of an outing I would use it all the time because in the dark it makes a huge difference, but it stays in the fly material and is very persistent in its smell. They also make a Squid, Mullet, Mole Crab and Sand Shrimp versions that I have not used because I don't encounter those very much in the areas I fish. But I am sure they work great in LI sound or RI/South Side of Cape Cod.